The Gigabyte Aero 15X is a fantastic laptop for tasks beyond gaming while maintaining its excellent battery life, making for a more versatile laptop than even last year. Just know that the competition has heated up fiercely since. Gigabyte’s updated Aero 15X gaming laptop for 2018 introduces hexa-core, Intel Core i7 processing and a 144Hz, 1080p display to its flagship mobile PC gaming device. The additions make for a fantastic laptop for tasks beyond gaming while maintaining its excellent battery life – an even more versatile laptop than last year. 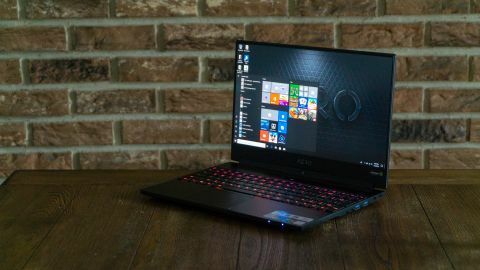 However, the competition has since released Nvidia Max-Q gaming laptops with more luxurious build materials and style – not to mention webcams that are placed at face level – for not much more than what Gigabyte is asking for to buy the Aero 15X. That’s not to say the Aero 15X isn’t worth your attention – on the contrary. Just know that the competition has heated up fiercely. Gigabyte is selling the latest Aero 15X to start at $2,299 (£2,199, about AU$3,039), which gets you a Full HD (1,920 x 1,080), 144Hz display with a 512GB solid-state drive (SSD) and 16GB of RAM. All else you see on the spec sheet remains in this configuration. Pony up another 200 bucks or quid to $2,499 (£2,399, about AU$3,299) to score that super-sharp, UHD 4K display and … not much else. Another 200 clams on top in exchange for a far sharper screen isn’t too bad of a deal, but its rivals offer an awfully similar experience for a few hundred less. Take the MSI GS65 Stealth, for instance: it doesn’t have a 4K display option, no. However, it offers up essentially the same starting configuration for just $1,999 (about £1,429, AU$2,609) – 300 bills cheaper than Gigabyte’s product. Meanwhile, the Razer Blade for 2018 with the same graphics chip listed here, as well as the same amount of storage and RAM and processor, will cost you $2,599 (£2,329, AU$3,999). When you’re already paying $2,300 for a gaming laptop whose build feels decent but not nearly as substantial as a Razer Blade, it’s worth considering ponying up for that and its 144Hz display. Remember, this is likely to be a product you’re going to use for several years. From the 2017 model we’ve reviewed, the Aero 15X design hasn’t changed all that drastically. One of the most striking changes is a new ‘Aero’ logo that sits proudly in white below the nearly bezel-less display. Also, the ‘Gigabyte’ logo on the laptop’s aluminum lid now lights up like an older (read: better) MacBook’s Apple logo. Beyond that, much of the design remains the same, from the brushed aluminum shell with two-piece base to the gorgeous display under a matte coating – and the webcam under the screen. Gigabyte did manage to shave four tenths of an inch from the laptop’s base height, which is nevertheless impressive with a substantial processor improvement in tow. That said, the Razer Blade is just as powerful and only 0.66 inches (16.8mm) thick. As for weight, Gigabyte too was able to cut it down to 4.49 pounds (2.04kg) – about exactly the weight of a Razer Blade. So, this is an awfully light 15-inch laptop, but it’s not the thinnest around nor is it the most attractive and luxurious feeling for such a price point. One thing that the Gigabyte Aero 15X holds over both the Razer Blade and GS65 Stealth is that it employs a full-size keyboard with numeric keypad. That’s a big deal to some gamers, especially those deep into massively multiplayer games. Good thing, too, then that it’s a pleasant RGB keyboard to type on, with deep enough travel and forceful feedback for both long-term typing and gaming. The touchpad is smooth and excellent as well, and we appreciate that it’s a clickpad – something Razer caught onto just this year. Kudos to Gigabyte for finally addressing the touchpad issues to make this laptop that much more usable without a mouse accessory. It’s still an Elan-made touchpad, but must be a higher quality model than used in years past. As for the display, color us hugely impressed. While the Ultra HD panel lacks the speedy, 144Hz refresh rate, it still makes movies look stunning and games look incredibly crisp. Thanks to calibration through X-Rite Pantone hardware and practices, this screen possesses a 100% Adobe RGB color gamut. Couple that with a super sharp resolution, and you have a brilliant display. The display is plenty bright, too, and is covered in a matte film to avoid glare. Both do wonders for combating sunlight while on the move. This point will come in handy, as you’ll soon learn that the Gigabyte is among the longest-lasting gaming laptops we’ve tested.